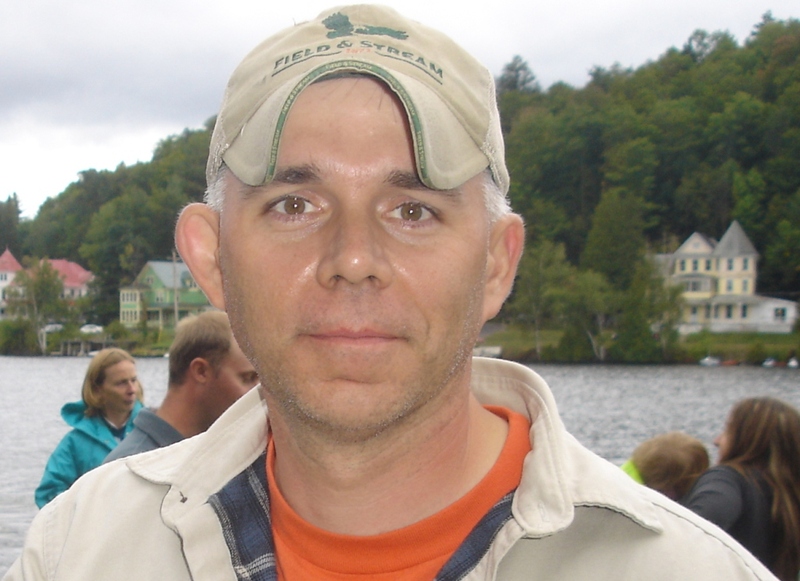 Last time we met John Homer who races in the Adirondack 90 Mile Canoe and Guideboat race. I need to clarify as to just how he got the guideboat he races in the 90 miler. 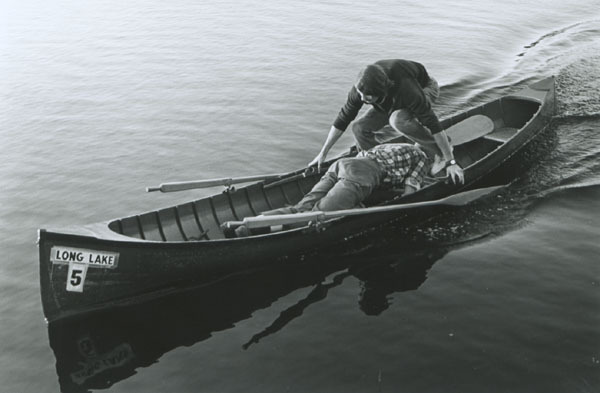 He did buy a guideboat from a fella in Saranac Lake but it was only a half of a boat. This boat was built by McCaffery, of Bloomingdale, NY, who built guideboats around 1910. It was stored in a barn by its owner. Disaster in the form of a falling tree took out the barn and one-half of the guideboat. 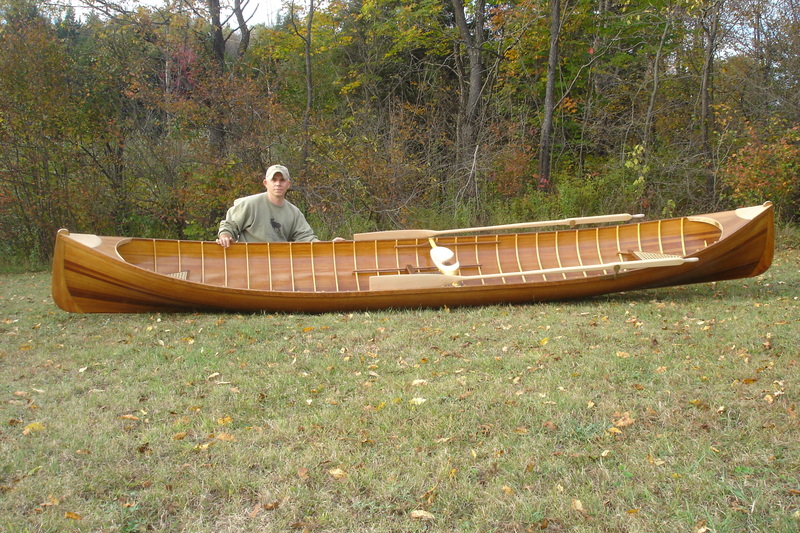 John purchased the good half and used it as a pattern for the boat he built. 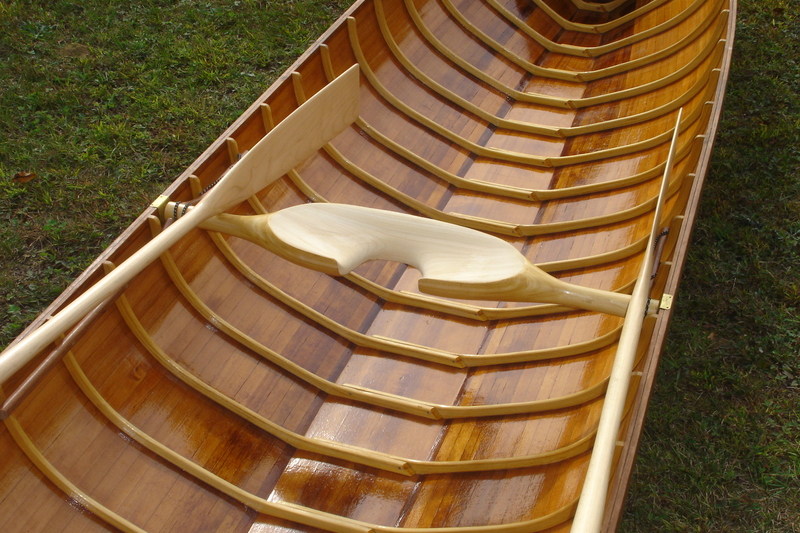 He stretched his boat to a little over 17′ long, a foot or so longer that the original. He feels his boat is a bit slower than guideboats with the normal length of 16 feet. Here is John’s boat outfitted for the Race. John’s boat rigged for the 90 Miler. The route of the 90 miler follows what Hallie Bond calls the central valley of the Adirondacks. It starts at Old Forge, NY at Old Forge Pond and proceeds northeast through a series of interconnected lakes called the Fulton Chain. These lakes possess no exotic Native American names but are simply numbered First through Eighth. The first carry is between Fifth and Sixth Lakes and is 1.1 miles long. After a carry at Eighth Lake you enter the Brown’s Track, a meandering stream that we will devote a separate post to. Coming out of Brown’s Track you enter Raquette Lake and head nearly due east into the Marion River. We are now in the old steamboat country that was described in early posts. After carrying over the Marion River Carry (the old railroad bed) we drop into Utowana Lake, row through Utowana and Eagle Lakes and into Blue Mountain Lake, our final destination for the first day. We have traveled 35 miles by boat and carried our boat for 3.5 miles. 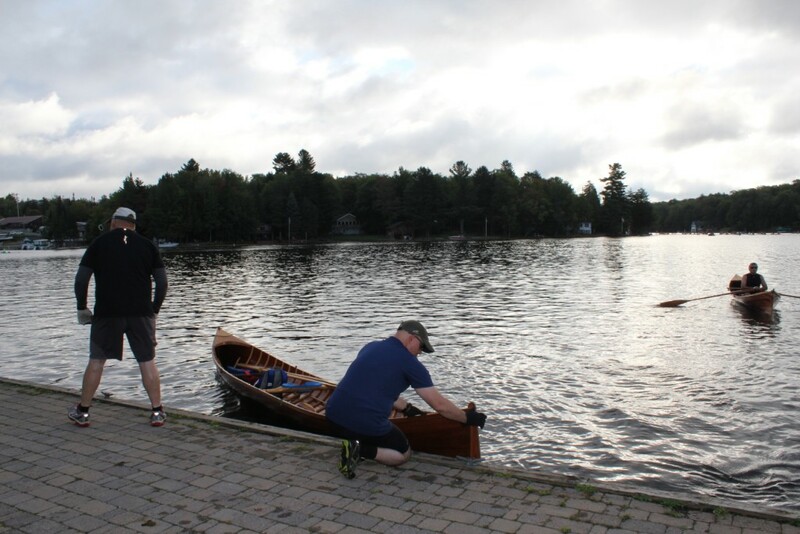 The second day starts at Bissell’s beach in Long Lake (right outside my door), goes under the bridge at the town beach and, at the northern end of the Lake, enters the Raquette River. There is a long carry on the River at Raquette Falls. Continuing down the Raquette the second day ends at the state boat launch about five miles east of the town of Tupper Lake. This leg is 30 miles long and has one carry of 1.25 miles. The third day of the race involves the Saranac Lakes; Upper, Middle, and Lower. These form sort of a lopsided U, with the right arm (Lower Saranac Lake) bent away from the left one (Upper Saranac Lake). Middle Saranac lies between the two. 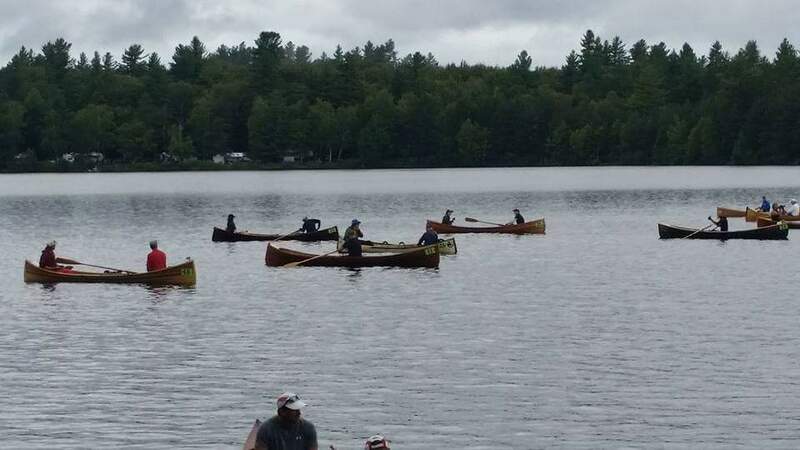 The Race starts at the west end of Upper Saranac Lake at the Fish Creek Campground. The racers quickly enter Upper Saranac Lake and head south. After the Bartlett Carry, you enter Middle Saranac Lake. Between Middle and Lower Saranac Lakes there is a hand operated lock that is fun to use if you have the time. The racers bypass it to save time and then follow either Lower Saranac Lake or the Saranac River to arrive at Oseetah Lake. From thence it is on to Lake Flower and the final destination of Prescott Park in the town of Saranac Lake. This final leg is the shortest of all, 25 miles, and there are three carries totaling one-half mile. I asked John some questions about his experience with the 90 Miler. Here is our dialogue. What do you like most about the 90 Miler?What do you like least? I enjoy the 90 Miler the most because it follows the route of the old days when guides used to bring people into the Great Camps and lodges to get away from the big city. I think about that often as I row from day to day and how it must have been in those days. I also enjoy the people that the 90 Miler brings together. I have made several new friends since doing the past five races. What is the hardest part of the 90 Miler? The hardest part for a guideboat is probably Brown’s Tract. With all the canoes and kayaks (in the race) it is difficult to maneuver a 16 foot plus boat through such a narrow passage. (Brown’s Tract will be covered in a separate post). You did the 90 Miler solo once and said never again. Why? 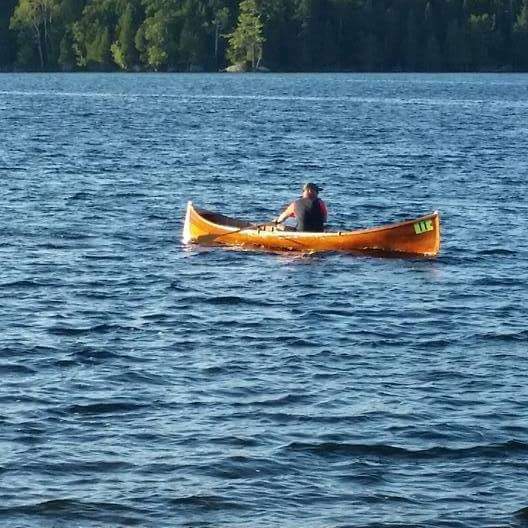 I believe I would do the 90 Miler by myself again but with a shorter boat. With my boat being almost 18 feet long it made it difficult by myself. But all the guideboaters stick together and help each other out so luckily it wasn’t too bad really. Here is John as a solo rower in the 90 Miler. Notice that he is taking a “peek” over his right shoulder to get his bearings. Guideboaters need good peripheral vision because they can only see where they have been and not where they are going. So they often glance over their shoulder to pick up landmarks. When I row the half mile or so across Long Lake to Sagamore Beach to go the Post Office I invariably miss the beach by 50 to 100 yards. So I can well identify with John who is trying to converge on a very small space after traveling many miles over open water. Here is where a partner in the race is invaluable. The partner provides “eyes” and a paddle to steer the craft. The following are photos of the race. Boats and boaters getting ready for launching. Guideboats awaiting the start of the day’s race. What are the carries like? The carries are OK as long as you rig up your boat for them. If you are solo you have to tie up your oars and seat so they won’t fall out during the carry. 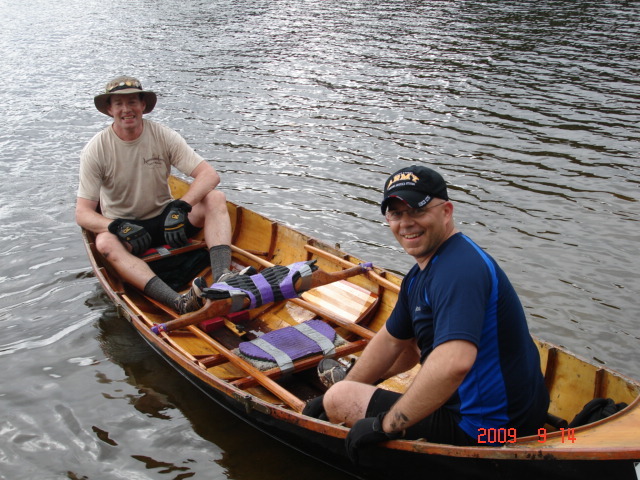 If you are a team your partner carries the oars and paddle and any water/food needed. 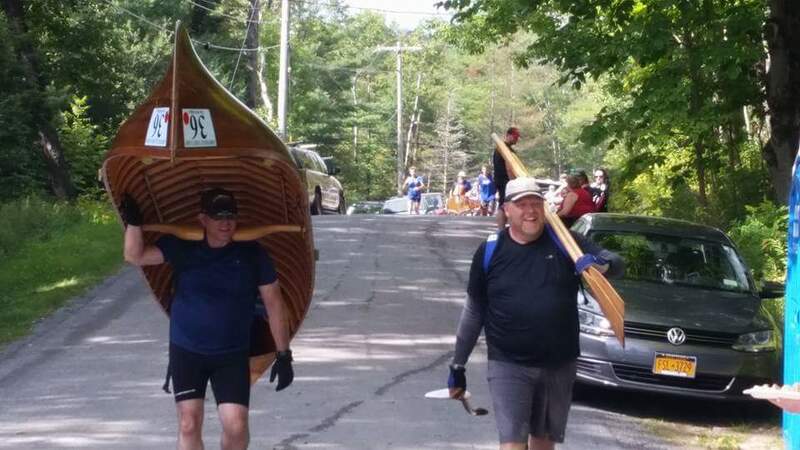 The good thing about doing the 90 Miler as a team is that you are able to take turns carrying the boat. If you are solo of course you are on your own and the longest carry is about 1 1/2 miles long. Here are John and his partner Ed on the carry between Fifth and Sixth Lakes. John and partner Ed on the carry between Fifth and Sixth Lakes. Next time-Wind, the enemy of the 90 Miler. 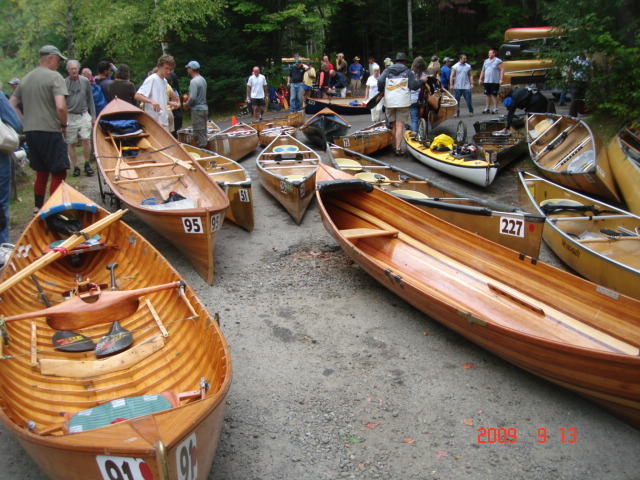 The 90 Miler, as it is known in the Adirondacks, is a three-day boat race held on the second weekend of September. It is open, not just to canoes, but to guideboats and kayaks as well. 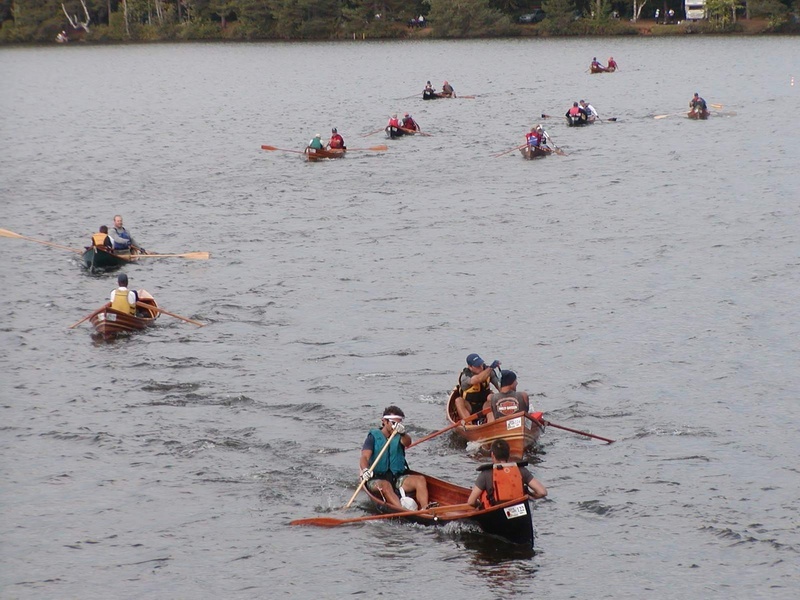 On day one the Canoe Classic starts in Old Forge, NY and by day three the racers are in Saranac Lake, NY. I am fortunate to know one of the guideboat racers in the Race, John Homer. John was kind enough to share his experiences with me while racing in the Classic. Here he is at the end of the Race on Day 3. He has just been presented with a pin for completing the race within the allotted time limit. John with racing partner, Chris Hoyt. John went on to add, “As for partners, I have done a few races with relatives, but as I got to know other guideboat racers we would offer each other’s boat as a team for the following year. Ed Vankuren and I raced solo before and got to know each other that way and decided to to row together the following year. Here they are together before the race. John and his partner Ed Vankuren before the race. 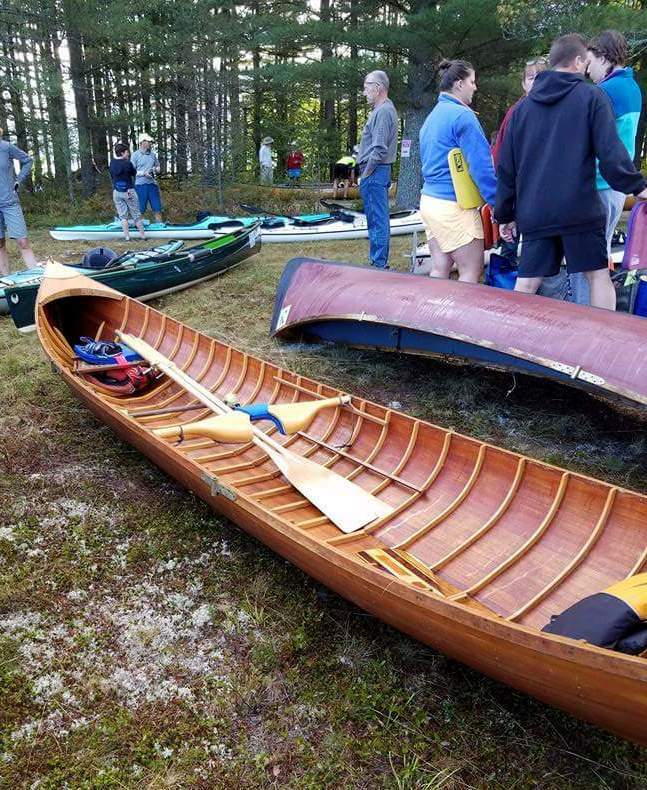 John was awarded the Robert L. Evans Memorial Adirondack Canoe Classic 90 Miler home-built boat award in 2015 for a guideboat he built. Here are a couple of photos of the boat he built, a beauty! John with the boat he built. A closer look at John’s boat. John also makes very handsome paddles. Here is one he made especially for guideboat racing. He calls it the 90 Miler. 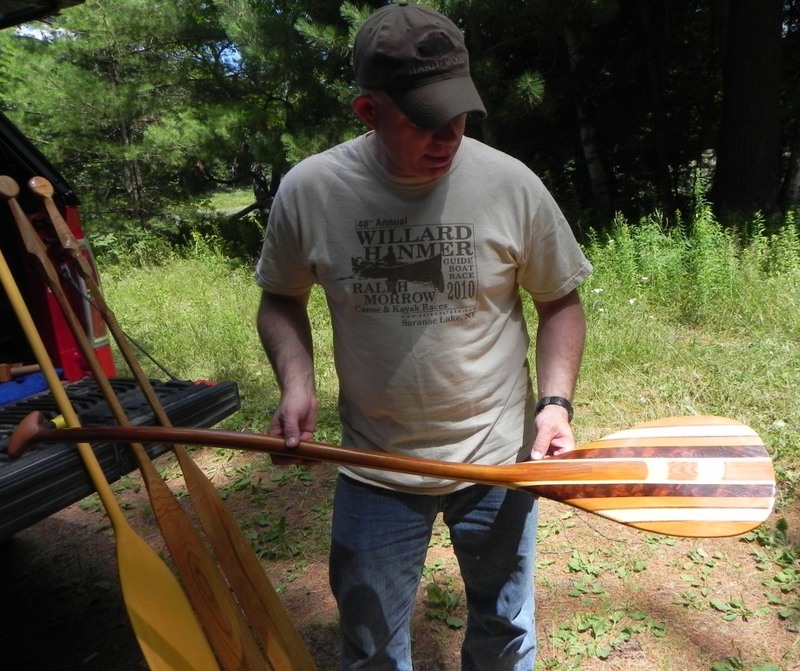 John with his 90 Miler guideboat paddle. I asked John if he ever switched positions with his partner during a race. Here is an old photo of that rather tricky maneuver. It may be of the famed guideboat racer Howard Seaman and his son. Guideboat racers switching positions during a race. Photo courtesy of The Adirondack Museum. Next time we will talk more about the route of the race and John’s experiences rowing it.